Q: How can a subwoofer driver play below its Fs (resonance frequency) point ? A: The Fs of a driver is taken in Free Air. As soon as you put it in a box you add resistance same as if you made the moving mass heavier, this lowers the resonance point. This is referred to as system resonance. With SLAPS you can tune this resonance point to be outside of the audible range. How low you can tune it really depends on the maximum excursion potential of the woofer you are using. You want the Slaps to start resisting the movement of the woofer before the woofer runs out of excursion as to prevent it from bottoming out. This is why only long stroke woofers should be used with SLAPS.The reason why subwoofers you might have heard in the past sound bad below their tuning point is simply because their design did not allow for a tuning point low enough for it to be outside of the audible range. 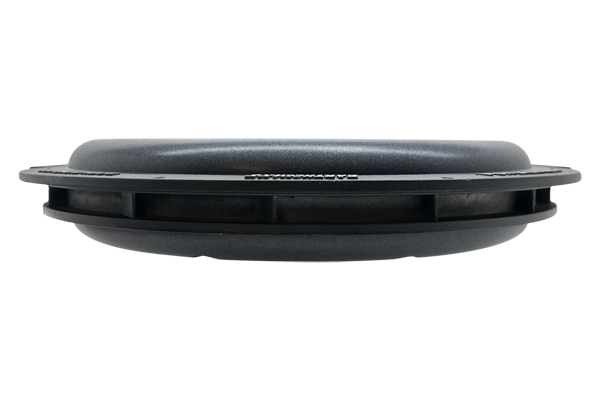 Slaps can not fix the sound if the primary woofer is distorting, instead it prevents the woofer from distorting in the first place by allowing a tuning frequency below audible range. With a Slaps energy below the tuning point typically below 20hz is translated by the slaps to powerful infrasonic energy (vibrations) that the human auditory system will detect as very low frequency sound, even though the ears are not capable of hearing it, your body will sense it. Same as how tactile transducers can stitch back the missing fundamental to an audio range through the body, so will this low frequency airborne energy. Q: Which is best - SLAPS or SLAPS-M Series? Is the music quality is the same between them? How about low frequency dynamic capability? Fx SLAPS12 has lower Fs and bigger outer diameter than SLAPS-M12. SLAPS-12 has Fs 17,6 Hz and SLAPS-M12 has 25,5 Hz. A: The Original SLAPS series is made specifically for use in our own subwoofers paired either with DBXi or MagmaX woofers, as such they have been optimized for that exact combination and the characteristics we wanted in those specific subwoofers. The Original SLAPS has a stiffer suspension than the M-Series, this was done because of the compromise we wanted to make between dynamic response and over-ring. In a passive design there is always a trade-off between distortion from over-ring and distortion from absorbed dynamics due to the resistance of the suspension. The stiffer the suspension the more motion is lost at a given pressure level. The looser the suspension the more over-ring will occur. You can not improve one without hurting the other so its about making the best compromise for the application. The stiffer suspension also puts a higher demand on the active driver, but since this was not intended from inception to be used with other than our own top of the line drivers, this was not a concern. From a macro view all these factors really are non-issues since any competing solution like portet/sealed has artifacts many times larger than SLAPS. Sealed has very high dynamic compression. Ported has terrible group delay and great problems with low frequency response. The M-Series was designed from the ground up to be as widely adaptable with other drivers and cabinet configurations as possible since they were intended to also be offered as a standalone retail product. So they offer a less stiff suspension with much greater excursion potential. The Fs is higher, but that's simply to enable them to be used in a wider array of configurations. You can add a little weight to it and the Fs will drop to that of the Original SLAPS or lower. Although there are differences between the two designs the music quality output will be very close. For all out bass war into low frequencies the M-Series will have the upper hand. Q: How many liter or cubic feet or cubic cm displacement does the SLAPS-12 and the DBXi-12D have when submerged into water? This value is important for cabinet calculation. A: This driver volume displacement has been accounted for in the SLAPS calculator program. The cabinet volume it gives is the exact one to be used. Many manufacturers does not give this value, and those who do, does not adhere to anyone standard. For this reason we, based on many tests, computed this into a set factor and added it to the calculations. Unless the driver used is of a new and previously unknown design that causes the magnet/motor system/basket to be extremely large or small compared to average then it is not an issue. Q: Differences between USA and EU Ts parameters, what's up with that? A: In the EU we try to whenever possible to obtain the TS specs using the high power V-I box method where specs are taken at the highest power level possible typically 100 watts or more. Standard TS parameters are taken at 1 to 3 watts, which paints a very inaccurate picture of a given high power long excursion woofer. This will in many instances lead to some differences in cabinet calculations.